Newly single Katie Holmes debut at New York Fashion Week is defiantly buzz worthy. The former Mrs. Cruise took it a step further when she and her stylist Jeanne Yang decided to show their collection, Holmes and Yang clothing, center stage in the famous "tents." Designers have the option to show at several venues, but Holmes chose to compete with the heavy hitters like Diane Von Fustenburg and Badgley Mishcka. Hopefully her collection will impress the many celebrities and fashion editors that frequent the tents during fashion week. 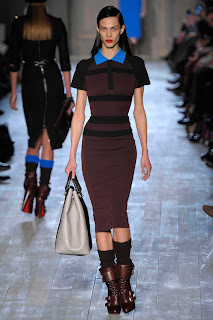 Victoria Beckham will be showing at fashion week as well. Her venue of choice is usually the the New York Public Library. Both collections will be shown on September 9. Shop Siren Chic: Dress Sale!! !